Our rider approved. everyday high performance squash tail. Josh Kerr gravitates to this design for its versatility and precision through and above the lip. If you're a back-foot orientated surfer go with the Redline. :: Unisex > Surfboards. Fins: FCS thrusterConstruction: PUAbility level: AdvancedSuited conditions: Punchy. solid surfLower rails: For quick. tight and responsive turnsFuller rocker: To optimize maneuverabilityDeep single concave: Designed for speed. which works well in fast. 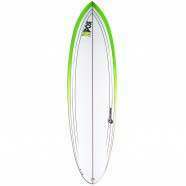 large\n and clean surfTail: SquashThickness: 2.12''Width: 18.18''Length: 6'0'' Size: one size.